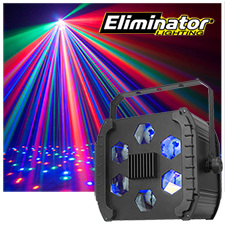 The LED Cloud from Eliminator Lighting is a powerful high output DMX fixture powered by 5x RGBWA LEDs rated @ 3W each. With its lightweight and compact size the LED Cloud is easy to transport to and from your gigs, whether its at a night club, bar or even a back yard party you can rest assure the LED Cloud will not disappoint. Offers 4 operational modes: Auto (built-in programs), Sound Active, Master/Slave and DMX. Best part of all the LED Cloud runs on minimum power consumption by using LED technology and emits little no heat.